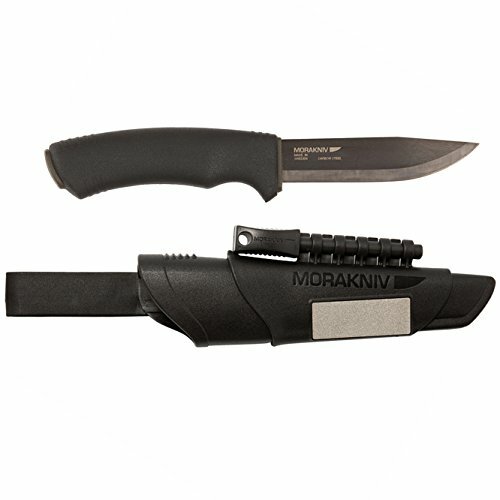 The Morakniv Bushcraft Survival Black is an indispensable tool for a variety of outdoor, hunting, emergency, or tactical applications. High carbon steels are preferred in applications that demand durability and frequent regrinding and at the core is the Bushcraft Black knife with its razor-sharp, burly 1/8-inch (3.2 mm) thick carbon steel blade treated with a tungsten DLC anti-corrosive black coating. The scandi grind makes it a perfect Bushcraft knife as it prevents the knife from slipping off easily, bites into the surface without getting stuck, is sharp, and stays sharp longer. The 4.3-inch (109 mm) long blade is relatively thin making it easier to carve with. The Bushcraft Survival Black comes with a black plastic sheath that holds a Morakniv Fire Starter (included) and features an integrated diamond sharpener, making it easy to sharpen the blade. The plastic sheath with belt loop will keep the Bushcraft Survival Black securely at your side and has a net weight of 8.1 oz. (229 g). The spine of the blade is ridge ground so that it can be used with the Morakniv fire starter that lasts approximately 7,000 strikes and produces a 3,000 degree spark, even when wet. The ergonomic handle with high-friction rubber grip gives the feeling of control, making work easier and more enjoyable, as if the knife were an extension of your hand. To further avoid corrosion, clean and wipe knife dry plus oil the blade after each use. Limited lifetime manufacturer’s warranty. Made in Sweden.